Since I was a kid a had a fascination with rockets, spaceships and other BIG stuff. 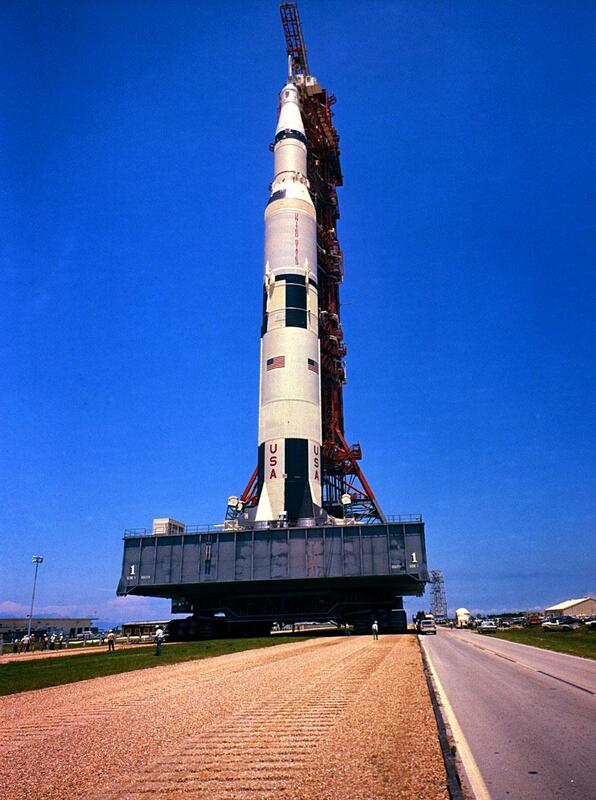 I loved the Saturn V rocket. But the crawler, the huge vehicle carrying it from the assembly complex to the launch pad, and the gantry did it for me. This fascination with BIG hardware is what sucked me into Science Fiction and stuff like the Culture universe of Iain Banks. Here you are talking about space ships 30km long. I mean, that’s from Martinsville to Indianapolis! And then there are the ‘orbitals’. Giant rings, 10 million kilometers in diameter, consisting of a string of plates each a thousand km square. Of course the Culture has all sorts of machines and robotic equipment for their building needs – and I guess a few thousand years of experience. After finding a contractor we finally broke ground in July of 2003. Those were exciting times. Daily videos of the progress were made. After a week the concrete foundation had settled and the frame for the basement went up. Day by day you could see it grow. After three weeks or so both floors were framed and the roof was covered. At that time I thought it would only be another few weeks until we could move into the new rooms. But little did I know how long hanging drywall would take. Upgrading the power connection to the house, installing electrical wires, light fixtures. Painting took forever. I wasn’t aware that they would stain the new doors right there in our basement. Hardwood floors. By November it was totally normal for us to share our limited living space with the contractor’s people – and then, five months after breaking ground, it was finished. I admit I had not appreciated all the planning and various steps of execution involving backhoes, concrete trucks, carpenters, roofers, gutterers, drywall-hangers, electricians, painters and a building inspector. And then, this summer, it was time to do something about our old rusty garden shed. We needed a dry space for the mower, four bikes and other stuff that is crowding our basement. After the old shed had been picked up for scrap metal I decided on a wooden 10×10 foot shed. Nothing fancy. A kit with all necessary parts. At first I thought about pouring a concrete foundation but my friend Dave quickly talked me out of that – water coming down the hill during a heavy rain might flood the concrete slab. Wooden posts would lift the structure above ground so that any water was able to pass underneath. Keep in mind now that I have never done anything like that before. I can repair my amps, program in a bunch of computer languages and I write pretty decent jazz tunes. But how would I make sure the holes I started to dig at the site were properly lined up so that the posts (16 of them, overkill!) would form a perfect 10×10 square? Well, I started out by making a 3D model in Cinema 4D to visualize it. After my kids had helped me picking out a shed at the hardware store I had second thoughts – not about quitting but rather about not using a kit which comes with all parts sawed to size but to build my own from scratch. My wife quickly talked me out of that – she knew I would have no time for anything else for the better part of a year and it would probably still come out crooked. In late September I started digging the first hole. I had planned to spend an hour or two a day digging holes for the posts. Once I had started I could see the construction site staring up at me through my office window every time I worked on my computer. What a good motivation for picking up a shovel and dig some more. After about a month I had 16 holes and the six kittens that were born at our house around June started using them as litter boxes. On a Saturday afternoon my friend Dave came over to help me setting the posts. I had bought 20 bags of concrete the day before and with string, stakes and other crude tools we tried to lay our posts out in a nice 10×10 square. That first afternoon we managed to put eight posts in and I did the rest on the following Sunday. A few days went by to let the concrete set then we screwed the boards to the posts. After that I put in some more cross boards for extra floor support. By that time I spent six hours a day out there. When I played gigs in the evening I couldn’t hold the strings down on my guitar because my fingers hurt from pressing the GO button on the screwdriver. The following Saturday the kit arrived in a huge package. Just unpacking all the parts took an afternoon. It’s Thursday now and since three days I have been building frames for the walls. Probably hammered in something like four pounds of nails. Tomorrow my wife and I will try to erect the walls on the site. I am sure it will be fun…. Wait a minute. Why am I telling this story? Because reading books of the Culture, watching Star Trek and consuming large quantities of Science Fiction in general has distorted my perception of reality. In the future, they make you believe, anything is possible. I mean, people like Stephen Baxter often write about alien races who are able to engineer galaxies according to their whims. That’s great and great fun, too. But it didn’t take rocket science to build that garden shed. Just time and sweat. There are about 32 or so individual parts my foundation is made of (not counting the screws). And despite careful measuring there still were some things that didn’t fit quite right. Nobody’s life depends on the function of this foundation. And yet I have been at it for two months – and it will probably turn out not to be perfectly square. Now if I look at that gantry for the Saturn V, I don’t think that came as a kit. That was planned and built from scratch. And at a height of around 120m it has a lot more parts than my foundation. And it has to actually work. 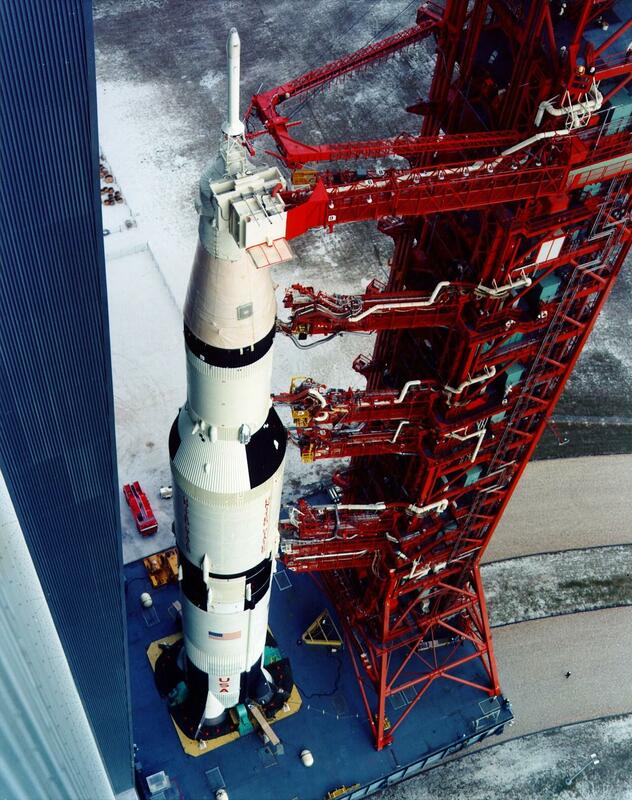 How much harder is it then to send something to the Moon, to build a human habitat there? Or on Mars? I mean, just getting all the power tools there. Oh wait, you also have to bring your own power outlets (let alone your own air). This stuff isn’t easy. And now I appreciate it more than ever before.